The political left has long tried to tell us how to think and act. I predict that the next major trend will be telling us what we can eat. 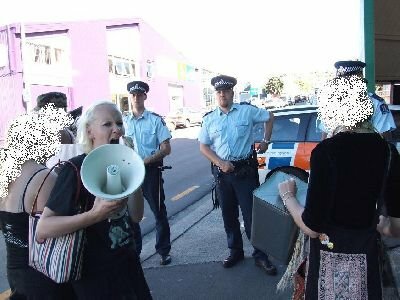 Activists have stormed butchers store several times over the past 36 hours, Meat on Tory a deli near wellingtons waterfront has been targeted due to the foi gras and veal they are selling. Prestons butchery a large meat retailer and wholesaler has also been stormed, with activists informing workers and passers by the of the destruction the system they are part of is causing. During the Prestons protest one activist was assaulted by police drawing blood and causing bruises. Inside prestons dead animals were being carved up and the floors of the processing area were covered in blood. Delegates at the meat conference in wellinton have had a dinner interrupted and an early morning wakeup. Last night delegates were follwed to a dinner being held at a wellington restaurant called POD. 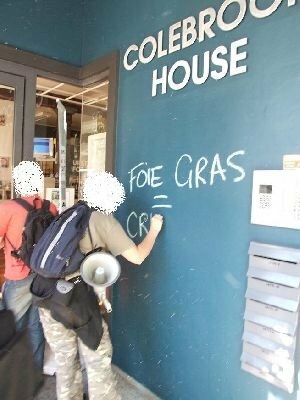 They had placards held against the restauarants window and the owners were informed of the animal abusing scum inside. Delegates at three wellington hotels offering discounts to conference goers were woken up at 5am with chants drums and whistles. The delegates are quite obviously shaken to know that people care enough about the animals to stand up against them. All those involved in the meat industry have are guilty of mass murder and environmental destruction. It is our duty to stand up and show our opposition to the ongoing destruction of our planet. These Marxists would freak out if they should ever visit the abattoir I've been working in this week. The place processes 16000 lambs in 8 hours ! Musnt stop the export trade to Iran. Keep up the good work comrade. Most Marxists I've met have been meat eating beer drinking types, who want to be down with the working classes. 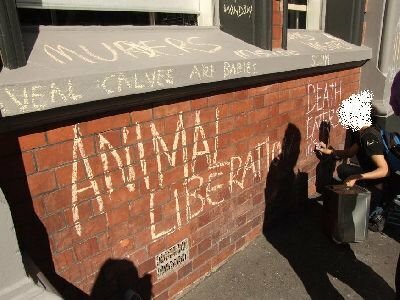 Animal rights activists are usually anarchists silly. Once you right wing falls work out the differences between Marxists/communists, life-style anarchists and class-struggle anarchists/libertarian communists then you might get a better handle on the New Zealand left. Lumping them altogether in one giant revolutionary soup pot shows how little you actually know about the NZ 'far' Left. Thanks anon, I think I've got a reasonably good understanding of the differing strands of the NZ left. Have you seen the uniforms the SPCA wear these days? they look like quasi police. Animal fascists. Trevor, some advice please. I believe in animal rights, but also small government. The latter stance led me to the ACT Party, where I have been a member for many years. However, all your posts against these evil and misguided animal rights activists has convinced me that I am in the wrong party. In your experience, what political philosophy should I embrace, and what political party do you think I would be more comfortable in? For the record, the force-feeding of birds (which is what foie gras is) is disgusting, as is the way that veal calves are raised.